Corksport really took care of me on this special little order here. It was back ordered from Green for about a month when I originally placed the order, but they stayed true to their expected delivery date to my doorstep. Their pricing was fair and they kept in close contact with me throughout the entire month, making sure I was well informed on when they would be getting it, and when it would be shipped and so forth. My friends have used Corksport many times, (buddies in NEPOC for their Proteges) but this was my first real time dealing with them (I ordered this along with my Knight Sport oil filters way back when) and I am just impressed with them. They certainly have a customer for life when I need parts they have. As for the filter, a great review was provided by RX Reviews a long while ago that I stumbled upon. 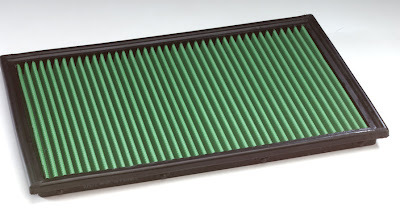 Reading it, it seems that the Green filter is a much better product all around then the K&N filter. It may essentially "filter less" but that simply means you just need to use the recharge kit at something like 15,000 miles as opposed to 30,000. I had swapped this in and immediately noticed the difference in the tone of the intake, both at idle and acceleration. At idle, you can hear more of the vacuum like noise coming from my Racing Beat air duct, while when accelerating, it's a deep strong sound. The gains are not too much. Some claim 2HP over K&N, but then again, my K&N filter was real dirty, so I would not be surprised if I managed to even get 5HP gain or something. Either way, feels good, sounds great, and for the same price as a K&N filter, I would go with this. Besides, I think everyone I know has K&N, why not be different?